Dining room with fridge and microwave and lounge . Located in a beautiful circle square (was previously the bullring), landscaped and without circulation of vehicles. Check in time start at 11:00 to 21:00 . 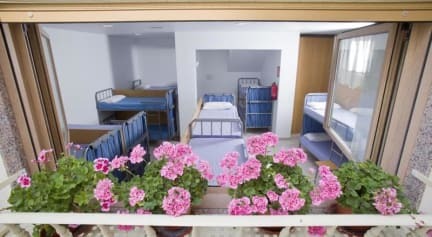 Quiet small dorm style Hostel. Price was about 12$ a night. Very clean, and the lady Blanca who runs the Hostel is very Helpful and nice. If you are looking for Luxury this isn't the place. If you are looking for a quiet, clean place to sleep for a few nights, with very helpful staff then this is the place to stay. I was very happy with my stay. Blanca, thank you so much for your welcoming little hideout in Logroño. Despite my lack of Spanish and your lack of English you did everything possible to make sure I was happy and comfortable in your hostel. As a tired solo traveler, I really appreciated it! This is a quiet place for a great nights sleep. Many people pass through on the Camino. It was simple but all you needed and so good for the price! It’s a short walk into the centre of town and the supermarket is right around the corner! When booking such a large dorm room I was not expecting the high level of comfort I received. I arrived on Monday when the hostel was quite empty, so I got my own private corner in the room with fresh sheets, blankets, and an extra pillow; my own power bar for charging. Little things like the placement of hooks for clothes/towels can make such a difference. The common area and kitchen have harsh lighting, which was the only downside. But Logroño is so fun, you can meet people and go out instead! Nice clean quiet hostel a 5 minute walk from the centre. It's a little further out gab the other hostels but this meant it was significantly quieter at night. Dormitory room was very clean, comfortable beds. Very friendly owner- she really will help you with anything. No real area for hanging out though there is an outside roof area which you can use if the weather is nice. Would recommend. Blanca was excellent. So very friendly and helpful. I was just here one night while on my Camino . It's a simple place, tiny with just a small kitchen, bathroom, and one room of beds, but the woman at the front is such a sweetheart. She was so kind and helpful, making sure I was happy and comfortable and offering lots of advice about the city. The lady that runs this place is an absolute gem. So lovely and helpful. She's speaks Spanish, German and Italian but still goes out of her way to help English speaking tourists and was very patient with me. It's a bit out of the way but definitely value for money and still walking distance to the old town/bus/train station.